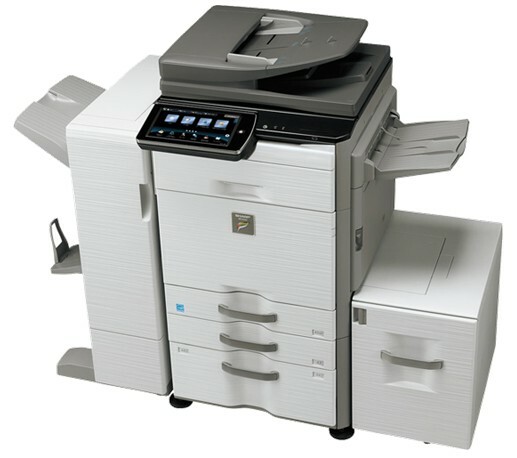 Just two years after the launch of the MX2610N, Sharp has announced the launch of their new A3 color range: the MX-2640N, MX-3140N and MX-3640N, running respectively at 26, 31 and 36 ppm onto A4 or Letter format. Still based around a large (10.1 inch) touch screen, the interface differs from its predecessor by an almost complete lack of physical buttons. Even job set-up quantities and launch run from the touch screen. To achieve this, the new screen is multi touch, which is to say that it detects multiple fingers simultaneously – which is very practical for zoom functions or for editing a document before print or transmission. Another new feature is the frontal high-capacity tray option, with a capacity of 2x 1000 sheets. Although it is possible to use two media of different type, it is not possible to refill one side while the other is in use. The lateral HCT can hold up to 3500 sheets, which gives these machines an overal capacity of some 6600 sheets. In terms of connectivity, the main change is that Wifi is standard. This is probably to promote the adoption of SharpDesk Mobile, an app for printing from or scanning to iOS or Android devices. Postscript comes as standard too. The full technical specs for these machines, along with all their pros and cons will be available to subscribers to DMO in the next few days.